Visitors to the ClassicLine Insurance sponsored Motorfest extravaganza have the chance to win a year’s free car insurance. The prize draw will be one of many highlights on 1st April which will see over 1,000 classic cars on display at Weston Park in Shropshire, as well as live arena parades, live music and plenty of other family fun. 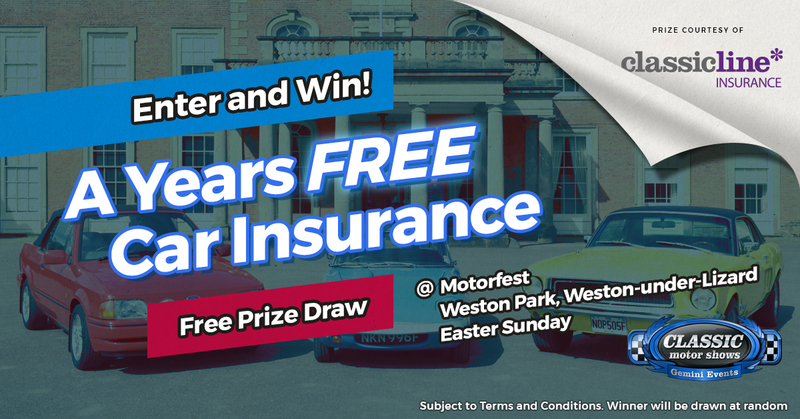 It’s no joke, on the 1st April at Motorfest we really are giving away a year’s free insurance for one policy worth up to £250 to one lucky winner. Celebrating its 31st anniversary year, arena highlights at Motorfest near Shifnal will include the ‘Pride of Ownership’ awards plus the famous ‘Decibel Duel’ to find the loudest vehicle at Weston Park. Live music is provided by The Quik Beats, a five-piece rock and soul band, plus Keep Calm and Carrie-Anne, a solo act who sings everything from the 1940s through to modern day hits.